Kauai is one of our favorite islands to go to with kids. It is the greenest and lushest Hawaiian island with great hikes, beautiful beaches and picturesque scenery. You won’t find opulent shopping malls or tall mega story beach hotels here which makes it a great escape for families in search of relaxation or active adventure. There are three main resort areas in Kauai, all of which can be good bases to explore the entire island. 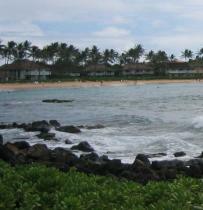 The South Shore (Poipu) is the sunniest and driest part of the island. The East Coast (Coconut Coast) is the most built up with stores, condos, etc. The North Shore (Hanalei) may get the most rain on the island but it has spectacular scenery and is the least built up area of the island. Here are some ideas for family activities when planning your trip to Kauai. Some of the calmer beaches that are good for swimming and snorkeling with kids in Kauai include: Anini Beach and Hanalei Bay Beach Park on the North Shore; Lydgate State Park, Kalapaki Beach, and Anahola Beach Park on the East Coast; Poipu Beach Park on the South Shore; and Salt Pond Beach Park on the West Coast. Other notable beaches which are great for taking in the scenery (but not necessarily for swimming) include: Lumahai Beach, Tunnels Beach and Haena Beach Park, and Kee Beach State Park on the North Shore; Mahaulepu Beach on the South Shore; and Polihale State Park on the West Coast. There are plenty of water activities in Kauai for kids who like to get wet. Kids who love water and waves could try taking a surfing lesson. Margo Oberg Surf School in the South Shore guarantees that you will surf after one lesson. They welcome children of all ages as long as they know how to swim. There are an ample amount of other surf shops on the North and South Shores of the island that rent surfboards and also provide lessons. Boogie boarding is also a great alternative for those who are less adventurous. Kayaking into the Huleia National Wildlife Refuge amidst lush scenery and endangered birds could be a great adventure for the whole family. The refuge is closed to the public so you will need to book your trip through a tour operator. The minimum age requirement on most tours is 6 years. However, there are a few that allow younger children on the tour. With calm beaches everywhere that are great for snorkeling, Kauai is a great place for kids to learn more about marine life. SeaFun Kauai is one tour operator who gives basic instruction and allows kids age 5 and up on its snorkeling tours. For kids age 5 and up, tubing through tunnels on a sugar plantation would be a unique and fun ride. Kauai Backcountry Adventures runs these tours on the East side of the island. Other popular water activities include fishing, water skiing, and wind surfing. For those who prefer sporting activities on land, horseback riding could be a great way to see parts of the island. Minimum age requirements vary from 4-8 years depending on the tour. Additionally, Kauai has several spots for good biking. You could do a sunrise or sunset ride from Waimea Canyon to the ocean. Other sporting activities on land include renting ATVs and golf. Kauai is a hiker’s paradise and there are trails for all abilities. 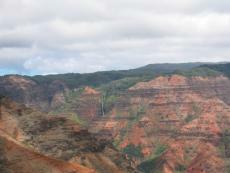 On the West side, visit Waimea Canyon which resembles the Grand Canyon. This is one of the driest hikes in Kauai so there is less risk of slipping if you are carrying little kids on your back. There are long rigorous hikes as well as shorter wide fire road type trails. Kokee State Park is at the end of the road through Waimea Canyon. One fairly easy hike in Kokee State Park is the Halemanu-Kokee trail. Kids can also visit the Kokee Natural History Museum to learn about the native birds of the island. There is a short quarter mile nature walk beginning near the museum to learn about different plants. Your child may also be tempted to buy corn to feed the many wild chickens you see near the museum. However, contrary to what you see, the park actually discourages it as the chickens are bad for the native plants and birds. On the North Shore, the Kalalau Trail in Na Pali Coast State Park is a rigorous 22 mile round trip hike. It is a stunning hike but probably better for those with older children as it is physically demanding with slippery conditions in areas. A few other interesting and easy hikes in Kauai include walking along Makawehi Point on the South Shore. This is a sand dune bluff with great views. Additionally, the half mile round-trip at the Keahua Arboretum Trail on the East side is popular with families. A boat or helicopter tour is a wonderful way to see the stunning scenery of the Na Pali coast and Waimea Canyon. Captain Andy’s Sailing Adventures is a great tour operator and children aged 2 and above are allowed on the cruises. Be sure to get in some whale watching if you happen to be in Kauai from December to March. Though a Luau seems like a tourist trap, it is actually a fun dining option for young children as the dancing and music can keep them entertained for hours. Smith’s Tropical Paradise Luau at the Wailua River on the East coast is a popular luau with kids because you can also start your evening with a tram ride and tour of the garden. Most major resorts also offer Luaus. While on the North Shore, don’t miss the Na Aina Kai Botanical Gardens. There is a children’s garden here that has a tropical jungle gym, tree house, maze, Jack and the Bean Stalk Giant, and a train ride. These gardens also lead to the ocean. Also on the North Shore is the Kilauea Point National Wildlife Refuge. This is great place for kids who are interested in birds as you can see dolphins, monk seals, and all sorts of birds. If you are near Lihue, you can go on a train ride at the Kilohana Pineapple Plantation . Kids will learn more about the history of the land while feeding animals and seeing indigenous agriculture. One of the most notable playgrounds in Kauai is the Kamalani playground on the East Shore which has a volcano slide and Japanese garden. Lastly, if you are in search of an option on a rainy day or an escape from the sun, visit the Children’s Discovery Museum on the East side which has lots of exhibits to keep kids busy.